Turkish Name: Rebel�in Korubeni Kelebeği. Distribution in Turkey: The north eastern region of Anatolia. Distribution in the world: Scandinavia, Central Europe, Southern Europe, Caucasus region, West Asia, Central Asia, North Asia. Living Area: 1000-2000 meters altitude plots. Openings in the forest, bush areas. Flight time: A single generation. May-June-July. Food Plants of the caterpillar: Caterpillars, Gentiana asclepiadea and G. cruciata feeds. Description-Notes: A small butterfly. Male butterflies wings are dark blue top has a narrow black edging strip. Wing six brown-red, beige blue. Female butterflies wing top, basal area brown to blue. Most of the time, black spots can be found on the front wing. Is very difficult or even impossible to distinguish alcon'dan Maculinea. A controversial species. 1000 meters below the first, "Maculinea alcon". 1000 meters above the first, "Maculinea Rebeli" is considered as. Larvae, ants moved into the slot by. Larvae, "queen ant" sounds similar to the sound issued for interest, to provide some form of protection is also reported. wonderful picture this Mountain Alcon Blue with full of its beauty. great picture with perfect sharpness and optimum colour and contrast. Masterpiece photograph of this beautiful butterfly, excellent sharpness and details, excellent composition, excellent background and lighting. Complimenti per gli ottimi dettagli di questa foto,eccellente nitidezza de ottimi colori stupenda la composizione bravo. An excellent macro with fine colors, details & pose. Very nicely composed & presented with a great POV. Nice work & TFS. Best Salam & wishes! amazing photo. A lot of details. I love this green colour. A perfect photo of this butterfly. Excellent detail, background and focus. Fantastic sharp detailed macro in splendid bright colours. Taken from a very good POV. Great composition with a nice blurry background. Another beauty.Superb composition,wonderful colours and light and excellent sharpness.Thank You. 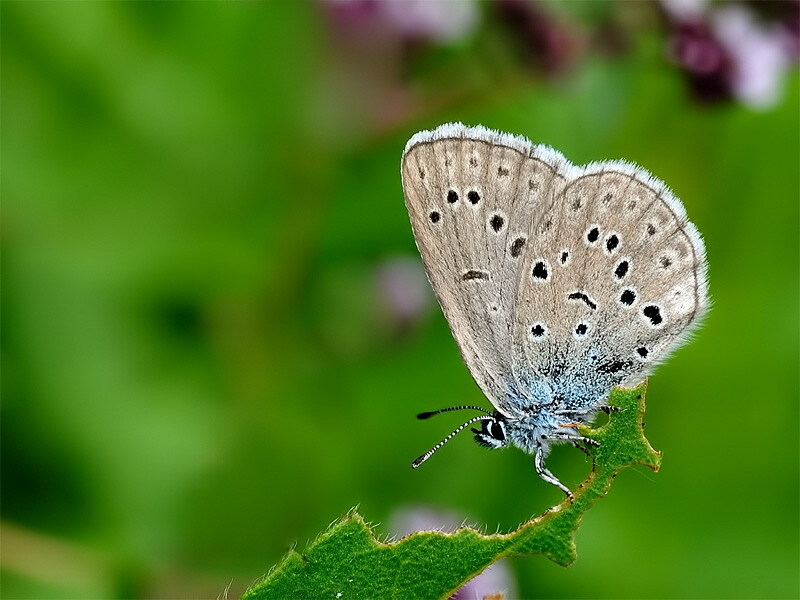 Fine image of this beautiful blue, its interesting to note the leaf where it is perched. tfs. These tiny butterflies looks a lot alike in many ways and I thought this was the same as in your previous posting, but they are not. No matter how exact some of their features are, you manage to photograph and present each of them in a special way, this Mountain Alcon Blue no exception. It is always a pleasure to stop by your postings as it is not only the picture that is great but the note too. Thanks for sharing. Best regards. Another marvelous composition. Wonderful photo with this very interesting butterfly specie. Perfect photo taken from a good POV. Splendid light......the details are fantastic. The POV is very good chosen. You're capturing well this butterfly by a good focus and excellent tone/clarity, so it's interesting and impressive to see the butterfly which has a black spot pattern in brown feather. It's interesting that this is stopping at the tip of leaf. And, it's good at the contrast of this target and blurred background. Ciao Seyfi. Razor details perfect sharp with magnificent colours against the brilliant BG. such a ovely butterfly with high definition of sharpness. The little blue on the thorax is very pretty and lovely. Excellent shallow depth giving and marvellous view.